Primula persimilis G.Hao, C.M.Hu & Y.Xu - Discovered near Luzhou, Sichuan, this species has white flowers with a tawny, hairy calyx. It belongs in Section Monocarpicae and strongly resembles P. tsiangii, but differs in flower color, capsule shape and length of pedicels and calyx. Primula scopulicola G.Hao, C.M.Hu & Y.Xu - A new member of Section Monocarpicae from Sichuan growing at the same location as P. persimilis. 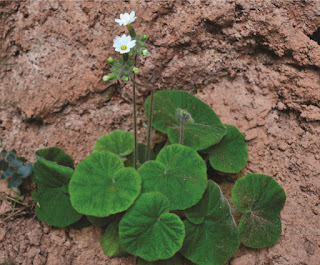 It most closely resembles P. lithophila which also grows in the same area but has smaller flowers, distinctly petiolate leaves, a campanulate calyx, and the capsule is globose (not cylindrical). Primula undulifolia G.Hao, C.M.Hu & Y.Xu - A new species from Hunan, named for the wavy and shallow undulations on the leaf margin. It is a member of section Carolinella which is noted for its calyptrate (opening by a lid) capsules and is similar to Primula kwangtungensis but differs by its smaller flowers and narrowly oblong leaves with an undulate margin. Primula wawushanica G.Hao, C.M.Hu & Y.Xu - This species was listed in my 2015 year end post, but it had not then been officially published. It belongs in Section Petiolares, Subsection Davidii and resembles P. fagosa and P. epilosa but is distinguished by sessile leaves, smaller flowers, shorter scape at flowering and a calyx split to 1/3. See the original description for images. 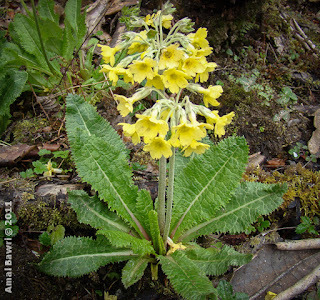 Primula calderiana Balf.f. & R.E.Cooper subsp. bawaii Bawri, Gajurel & M.L.Khan - Differs from P. calderiana subsp. strumosa (P. strumosa) by having efarinose leaves, the calyx cut slightly deeper into lobes with an cute apex, and emarginated petal lobes. it is unclear how this subspecies differs from P. strumosa var. perlata or the yellow form of P. tsariensis. Happy New Year and Best Wishes to All in 2017! Exciting that there are so many new species still being discovered. Really makes you want to get out there and explore! Added new images: P. henrici, P. bullata, P. sieboldii, P. atrodentata, P. griffithii, P. muscoides, P. hubeiensis, P. alcalina, P. saxatilis, P. utahensis, P. vaginata, P. bhutanica, P. whitei, P. denticulata, P. sessilis, P. filipes, P. pulchra, P. carolinehenryae. Added new information: P. maximowiczii, P. botschantzevii, P. macrocarpa, P. undulifolia, P. wawushanica, P. persimilis, P. cavaleriei, P. lithophila, P. tsiangii, P. scopulicola, P. biserrata. If you have photographs of Primula in the wild, please consider contacting the webmaster for identifications and for possible inclusion in the Species Gallery. See the Image Submissions page for more details.